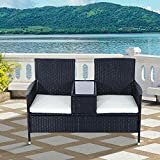 Take luxury living to a whole new level with these rattan garden sofas that would add value to any garden or backyard converting them into a luxury living area. 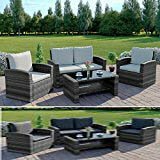 THREE-PIECE OUTDOOR DINING SET: Includes two loveseats and a square coffee table. 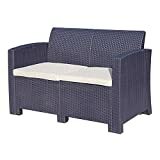 Can easily fit any indoor and outdoor areas. 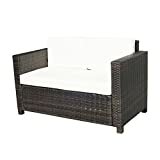 STURDY RATTAN CONSTRUCTION: Low maintenance, weather resistant and durable. METAL FRAME: Gives extra support and stability for years to come. COMFORTABLE: Padded cushions all over provide hours of support and relaxation. TEMPERED GLASS TABLETOP: Adds a sleek finishing touch which is also easy to clean and maintain. 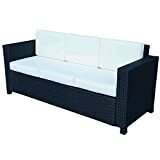 DIMENSIONS: Loveseat one: 145W x 75D x 62Hcm. Loveseat two: 137W x 67D x 62Hcm. Table: 60L x 60W x 30Hcm. MAXIMUM WEIGHT CAPACITY: Love seat: 240kg (evenly distributed). Table: 50kg. ASSEMBLY REQUIRED. 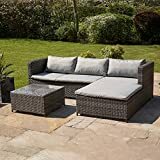 10cm Base Cushions and 8 cm back cushions for extra Comfort. (other sellers' are 5cm). Compared with other cheaper ones, our cushions are filled with 28D fire retardant sponge, and exceed UK standard regulations. Cushions are covered with 180g, waterproof polyester fabric, which are removable and machine washable. Made of powder coated metal frame. Compared with other sellers' iron frame, our sets are not easy to rust, rough and deform, so it can be left outside all the year round against all weather conditions. Dimensions: Corner Sofa's - W:70cm (28") x D:70cm (28") x H:68cm (27"), Middle Sofa - W:62cm (24") x D:70cm(28") x H:68cm (27") - please check dimensions graphic for more detailed information. Dimensions: Stool W:70cm (28") x D:70cm (28") x H:35cm (14"), Table W:60cm (24") x D:60cm (24") x H:35cm (14") - please check dimensions graphic for more detailed information. Low maintenance simply wipe with a damp cloth, self assembly required. 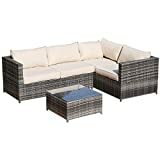 Suitable for any indoor or outdoor living space. Our cushions are 100% showerproof and have a expensive pipped finish. All cushions covers are removable and machine washable. Only covers, the padding is not included. 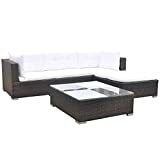 2 Seat Sofa Sets with Coffee Table. 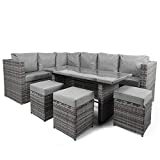 Showcase your outdoor garden, patio or indoor conservatory area with this stylish bistro set. Constructed using quality high grade PE woven ratten. 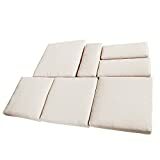 The cushions filled with fire retardant sponge which are fire retardant. 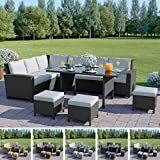 All the seat and back cushions are included and washable, small pillow cushions are not included. 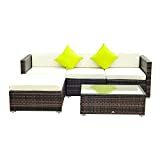 Set includes: 1 x 3 seater sofa, 1 x 2 seater sofa, 1 x glass topped coffee table . 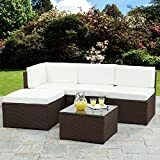 Measurements:Overall size for L shaped sofa: 181 x 181 x 66CM; 3 Seater sofa : L181 x W64 x H 66cm; 2 Seater sofa : L120 x W64 x H 66cm; Coffee table: 64x 64x 38cm; Seat height: 40CM (including cushion); Seat depth:55cm . Delivered Flat Pack for home assembly. Mainland UK Delivery Only. We cannot deliver to Highlands or Islands of Scotland, Northern Ireland, Isle of Man or Channel Islands.